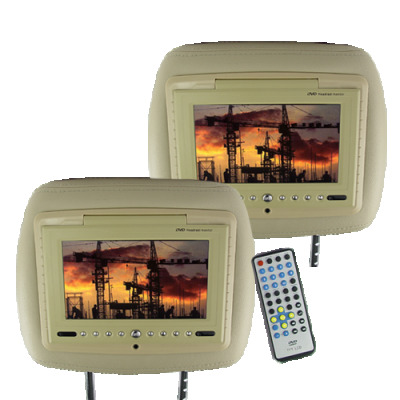 Successfully Added 7 Inch LCD Car Headrest DVD Player + FM Transmitter -Pair -Tan to your Shopping Cart. Car Headrest DVD player system with a high quality faux leather exterior in tan, and a super large 7 inch TFT LCD display for letting passengers in the back seats really enjoy movies as you drive. This Car DVD accessory features a built-in region-free DVD player and a FM transmitter for sending audio directly to your car stereo for the incredible sound your cars own sound system can provide. The headrests also have a 3.5mm earphone jack, and the ability to play CD's, digital media via SD card or USB input, and can play NES ROM's burnt to disc. Other great features include AV IN and AV OUT, adjustable struts for the easy installation, and an all in one kit featuring everything you will need to quickly and easily install this great addition to your family car. Order yours now and keep your backseat passengers entertained while you concentrate on the road. A great gift for the whole family! - Space Between Struts: 130mm. Adjustable to 180mm. This is not a review , I need to know the Dimension of the package , and I'd like a Link or a pdf of the installation manual . Thank you [Chinavasion Editor: Dear Lazaros, the dimensions for the 7 Inch LCD Car Headrest DVD Player + FM Transmitter -Pair -Tan is L:210 x W:275 x D:110 (mm)].